Well hello there! Happy Tuesday! 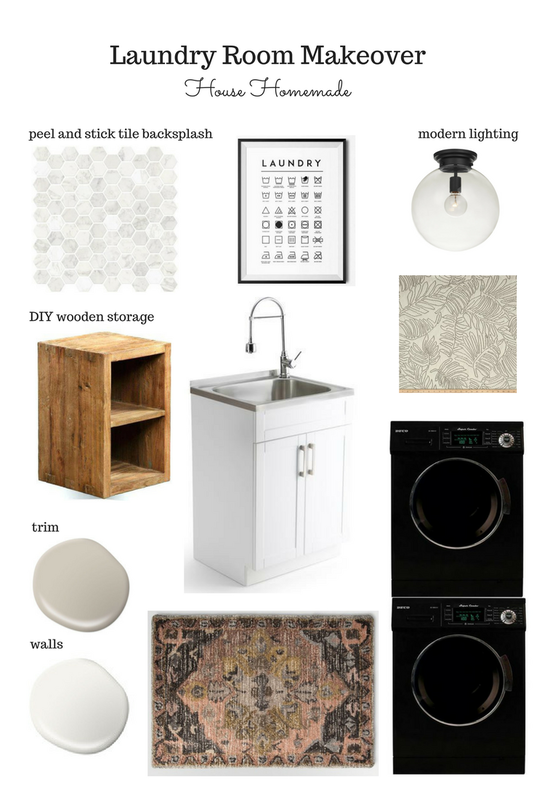 Today I wanted to show you plans for a laundry room refresh I'm getting ready to start. CLAP HANDS EMOJI!! This space goes relatively unloved by me. It's the laundry room....ugh.. But I'm so excited for where I'll take it! *this post contains affiliate links. Way back at the very beginning of my blogging venture, I did a really cheap refresh of the space. Basically, I picked up in there and cleaned the sink....Then took very dark pictures. You can see that post here. This time, though, I'm ready to give the space some fresh paint and really try to freshen things up. 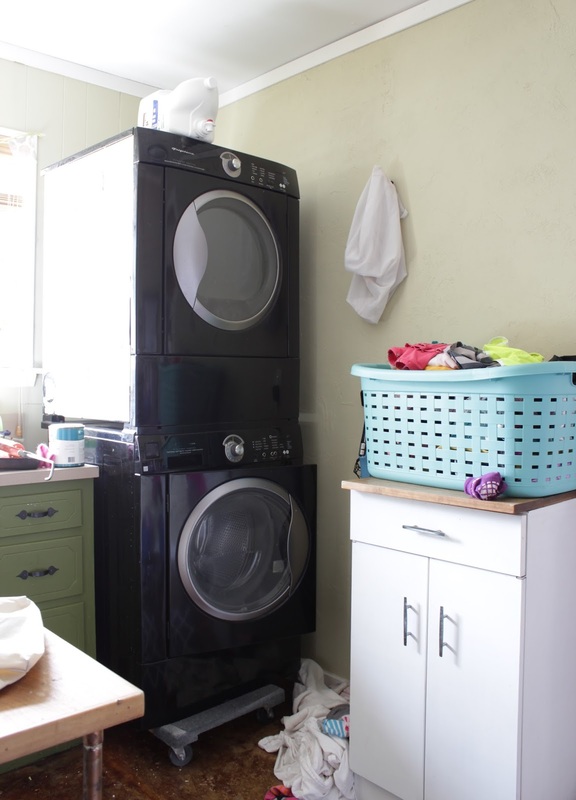 This is the view you see from the kitchen into the laundry room. It's a light green right now, I probably painted it 7ish years ago so it's been a while. 2 years ago I painted the cabinet base. Y'all, this is real life. Over flowing trash and ALL. From the door in the kitchen you can also see the "mud room" section where all of the girls coats, backpacks and shoes hang out. 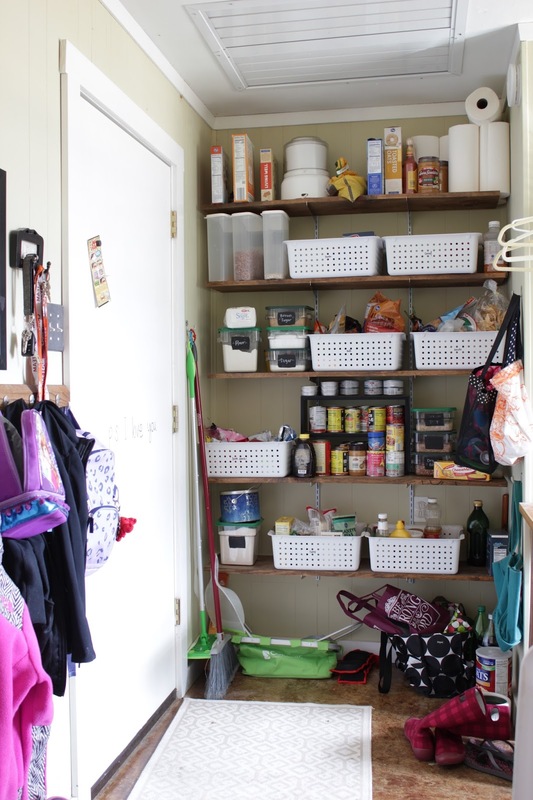 This room also acts as our pantry. When I redid the room last time I added a curtain to hide the pantry...What do you think? Should I do that again to cut down on the visual and actual clutter? Finally we have the washer and dryer. Man, I really don't give this room enough credit. 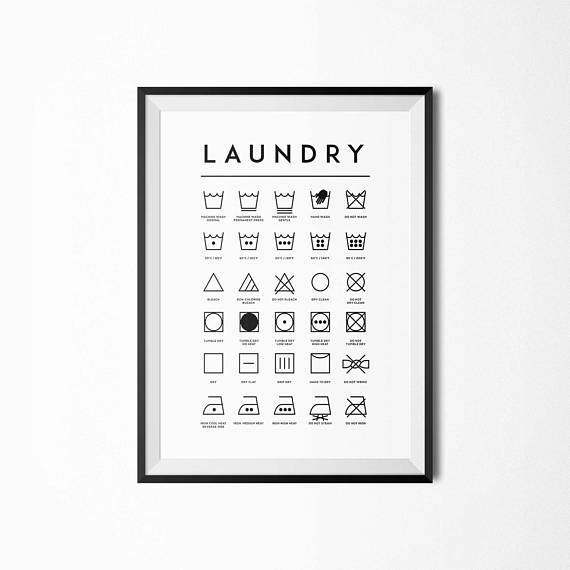 It's way more multi purpose than just a laundry room.. It needs a new name.. what should we call it? Did you notice our washer and dryer are on a dolly? I'm sure that's TOTALLY safe... We put them on it a couple weeks ago when we (by we I mean my sweet man) had to fix a leak. I told him to keep them on the dolly so that I could paint easier when the time came. Speaking of time and of paint. It's time! 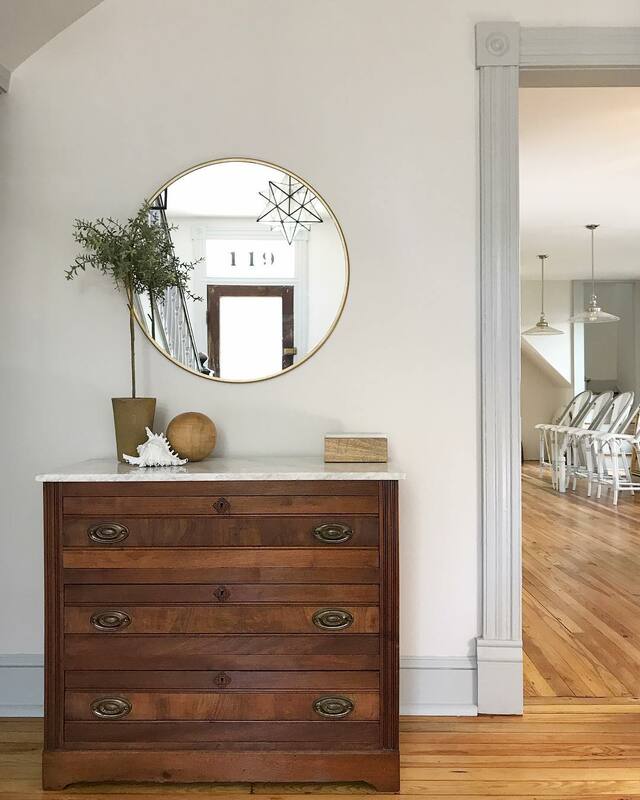 I've been inspired by a trend I've been seeing of light walls and darker trim. When I think of it, this exact image from Young House Love comes to mind. **please make sure and pin the following images from their original sources. Thanks! I love how it's neutral and still light and bright but gives a bit more interest to the room. Now, I would never want to do this in the rest of our house. With our open floor plan, I'd have to include 3 rooms and a hallway of baseboards and 6 doors. Um no. 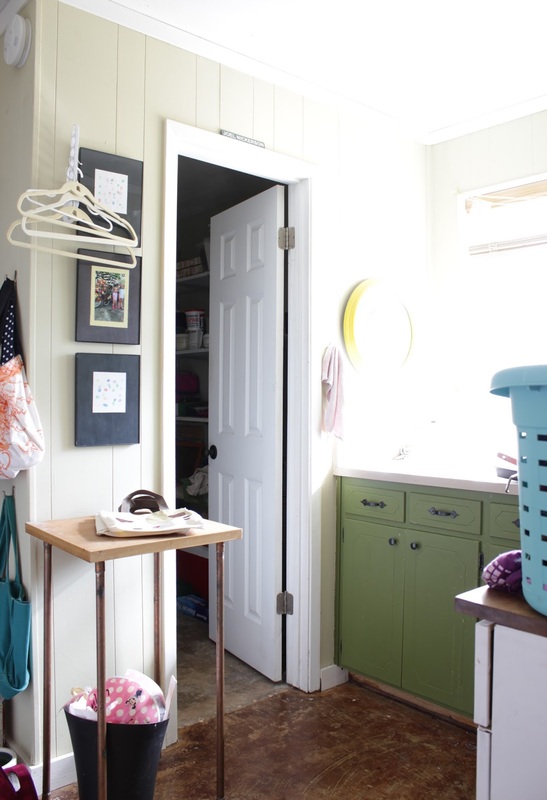 But with our small laundry room, it's totally doable!! I'm so thankful to Behr for providing the paint for this project. I'll be painting the walls "Polar Bear". 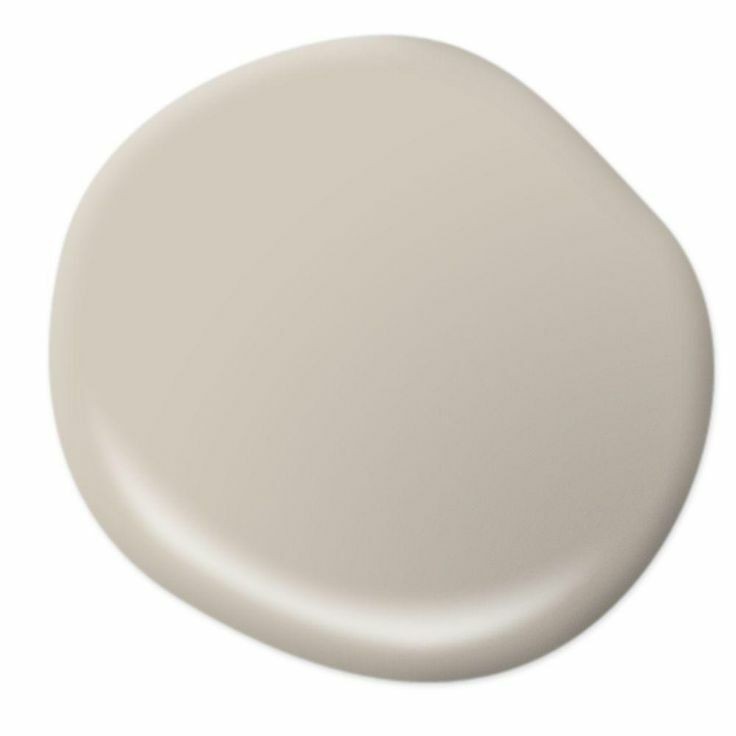 And the baseboards, door trim and doors will be getting the color 'Shoreline Haze'. I LOVE this color. It's so good and warm. I am a greige girl. What can I say? 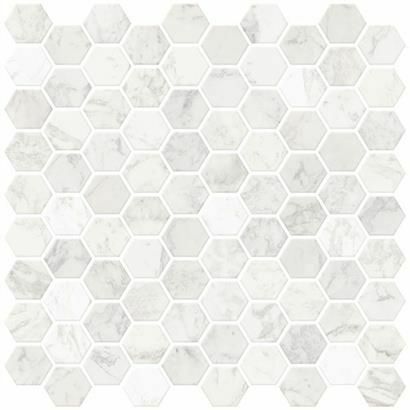 I plan to try out some cool peel and stick tiles from Brewster Home Fashions. 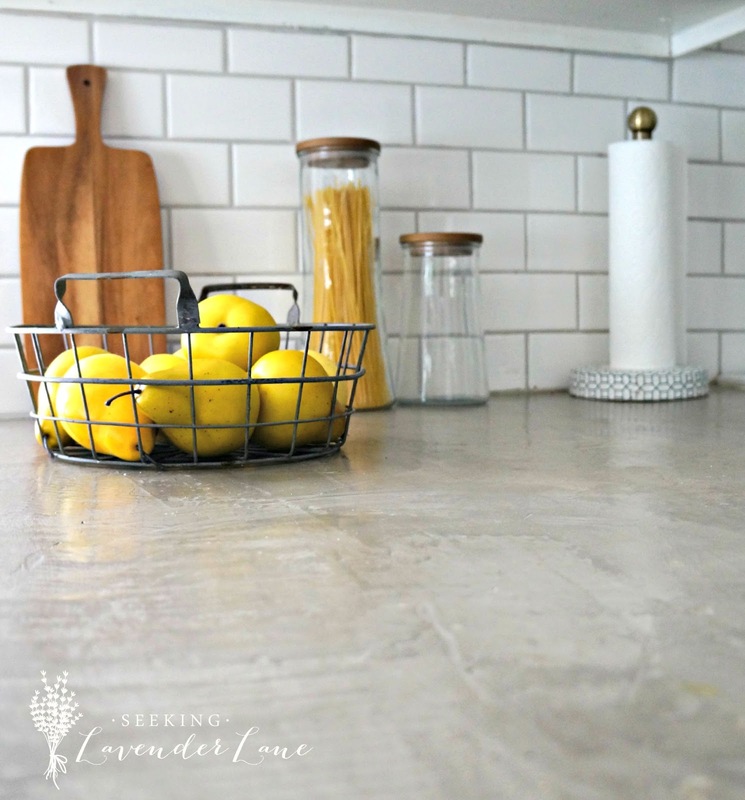 I think I'll put them over the laminate backsplash unless my husband thinks I can remove that lip without a problem. It would be cool to take that part off and be able to "tile" to the window trim. We have a Re-store very close to us that sells second hand building supplies. 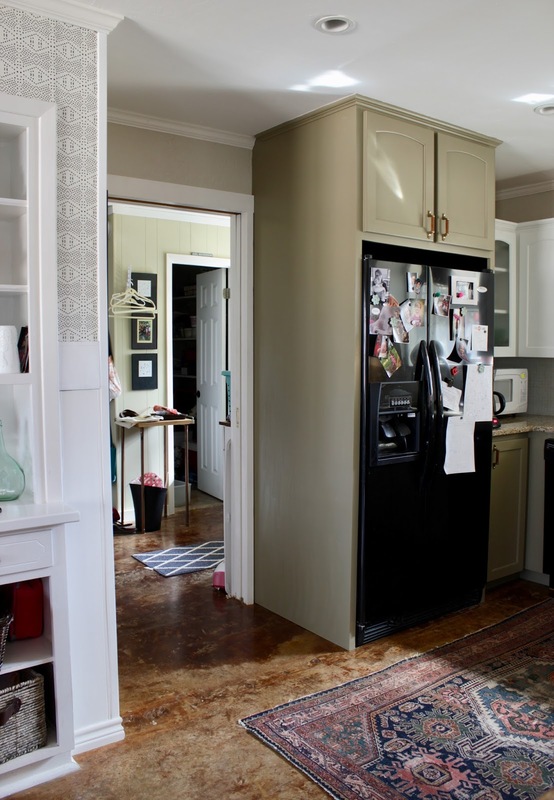 I saw a laminate faux wood countertop. 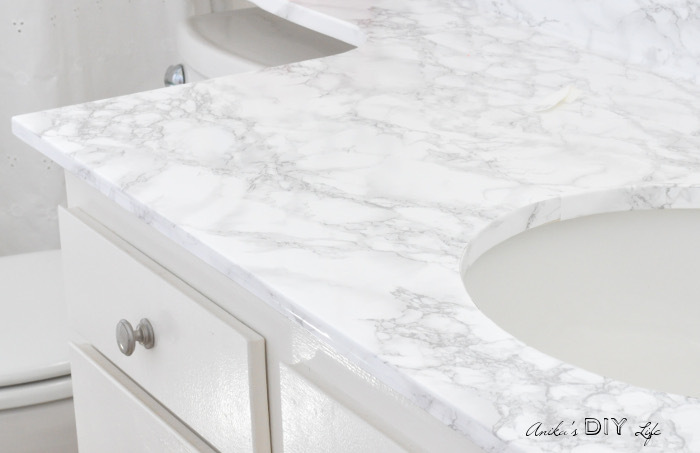 My husband would have to cut it to size and add a hole for the sink but at $20 that's an option. 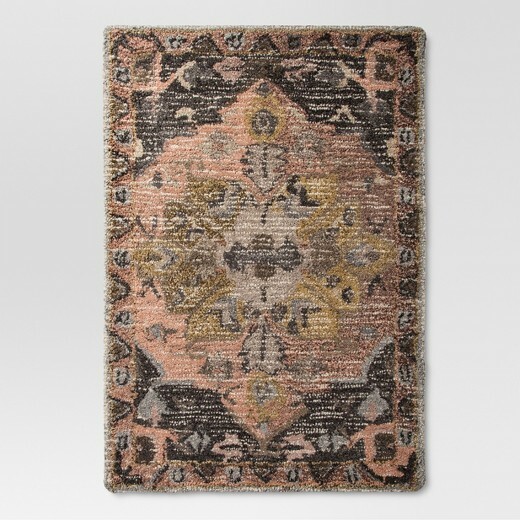 Similar product but way better color scheme when compared to the beige-y pink situation we have going on now. ..before you judge, she did an update almost a year later and it looked great! The space will get a new, modern light fixture from Globe Electric. I've worked with them before. 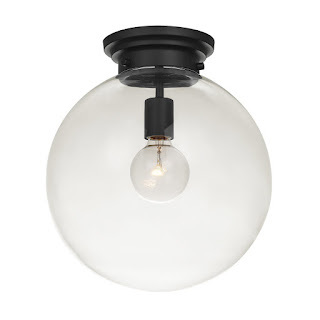 Their awesome light bulbs are the ones that prompted the dining room light makeover. The floor is getting this pretty from Tar-jay. 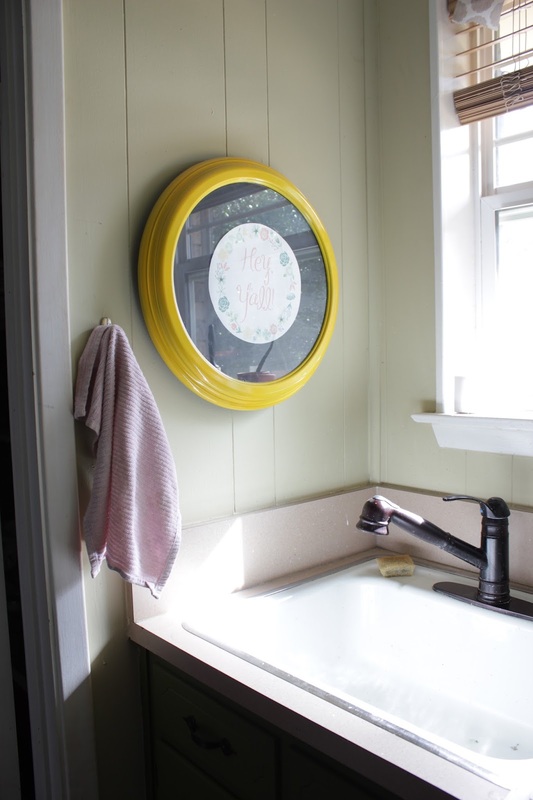 In my inspiration board I have this pretty laundry room print you can find here. I love it but I think it might be fun to make some kind of DIY banner or something...We'll see. I also plan to make some sort wooden storage or organizational somethin'- somethin'. Obviously, I'll let you know once I know. 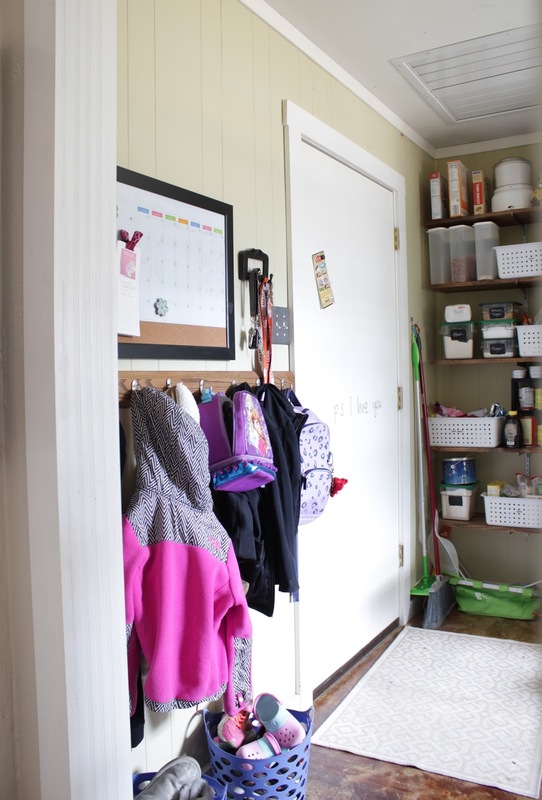 There's not much wall space to work with after the hooks for backpacks, the pantry and then the shared wall with the kitchen is a pocket door limiting what I can do over there. I'm pretty excited about this design plan. I hope it ends up looking a little more like the rest of our house right now. 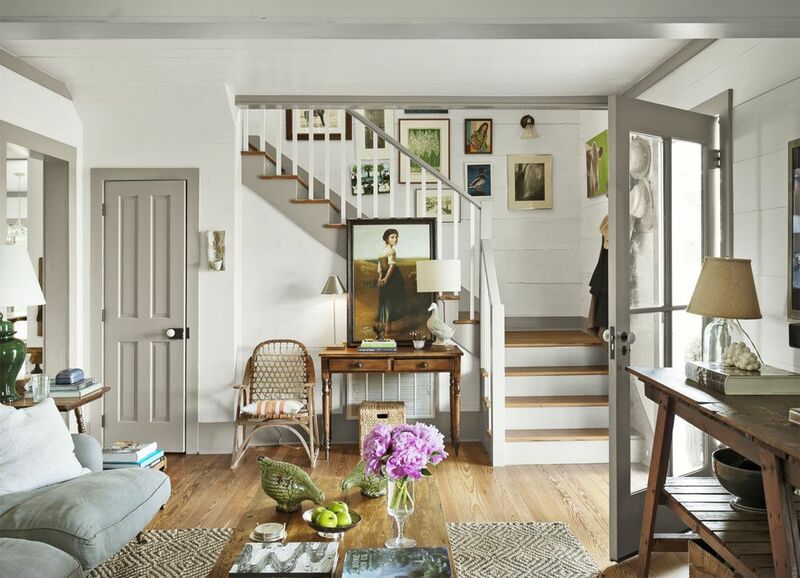 Neutral, bright and a little more pulled together. Wont the darker trim and white walls be such a cool contrast from this view?! So what do you think? 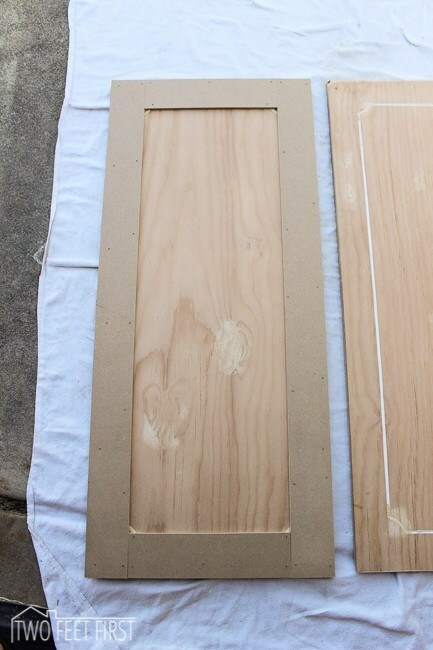 Have you attempted any of the DIY's I linked to? Is there something you're curious to see me try? I'd love to know. Leave a comment!